Formerly known as Santogold before being forced to change her name after being threatened with legal action by jeweler and business man Santo Gold, the artist now known as Santigold born Santi White will be kicking off her North American tour starting May 21st in San Francisco, CA and ending June 21st in Los Angeles, CA. The singer will be on tour promoting her formerly self-titled debut album from 2008 entitled, “Santogold” which reached No. 74 on the Billboard 200 chart and will be making stops through Baltimore, Boston, Philadelphia, St. Louis, and Austin amongst others with a live band by her side and opening acts Trouble Andrew, and rapper Amanda Blank. Reportedly, after the singer finishes up touring, she will be heading back into the studio to record her sophomore album. 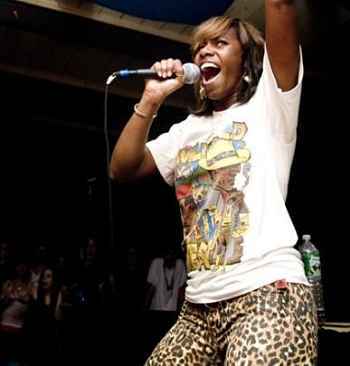 In related news, Santigold released ‘Brooklyn Go Hard,’ featuring rapper Jay-Z which rapper/music producer Kanye West produced by sampling her single ‘Shove It.’ The song “Shove It” the lead single from Notorious biopic.